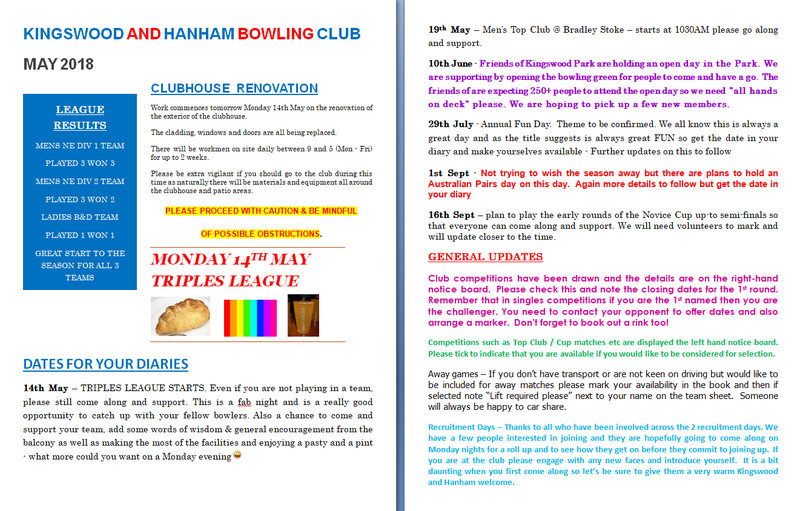 We are proud to announce that Kingswood and Hanham Bowls Club have now taken over the running of the green and clubhouse from South Gloucester Council! The Green is situated at the bottom of Kingswood Park, Bristol, and we are going from strength to strength. We have an excellent clubhouse which includes a well-stocked bar, changing rooms and a sunny terrace. It is also used for social events during the summer AND during the winter. 2018 will see us undertake a complete refurbishment of the outside of the clubhouse and we are grateful for the help and support of South Gloucester Council in helping us with this modernisation. The social areas of the clubhouse and the honours boards were re-decorated and renewed last year, and the new external cladding was completed in June 2018. Both have made a really big improvement to our facilities. New members are always welcome, with or without bowls experience! Why not come along and give it a try? We are a very friendly club and play matches all over Bristol and places further afield like Bath, Yate, Portishead, Melksham, Burnham, Tiverton and Chippenham to name but a few! We have two open days on May 5th and May 11th. We are open from 10.30 to 16.30. Why not come and give lawn bowls a try?